ISLAMABAD – Pakistan on Monday endorsed the United Nations’ list of banned terrorist organisations by designating the said outfits ‘terrorists of hearts’ in Pakistan, The Dependent has learnt. 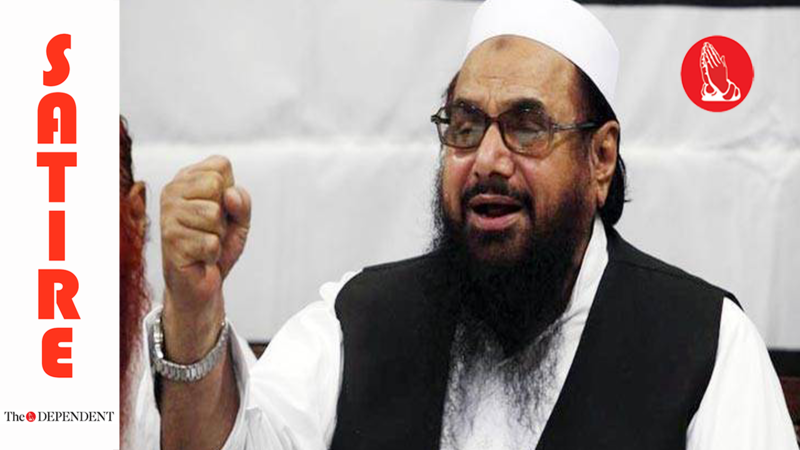 The development means that Hafiz Saeed’s groups including Lashkar-e-Taiba and Jamat-along with the 27 other banned outfits on the aforesaid UN list, have now been declared terror groups of hearts. Sources within the ruling Pakistan Muslim League-Nawaz (PML-N) confirmed that Hafiz Saeed has been conveyed by the government that he is being designated a terrorist of hearts, not terrorist. “After Prime Minister of Hearts Nawaz Sharif and Finance Minister of Hearts Ishaq Dar, we also have a terrorist of hearts in Hafiz Saeed, to ensure that both the cabinet of hearts and anti-state elements of hearts continue to grow in unison in this state of the hearts,” Information Minister Marriyum Aurangzeb told The Dependent. Government officials have further confirmed that the announcement was deliberately made in the build up to Valentine’s Day to making it more ‘fitting’. “Yes, the aim was to finalise it before Valentine’s Day on February 14,” said a senior official. “It had nothing to do with the Financial Action Task Force (FATF) meeting in Paris scheduled from the 18th to 23rd of this month.